Glenn Iba recently wrote me about his puzzle game Monorail for iPhone and iPad. There was no need to: that game was already installed on my iPod and it's one of the most interesting puzzles I know. All the grids provided have a unique solution, which is somewhat surprising initially: the pre-drawn lines are such subtle clues that they almost don't seem to be there. These puzzles are also known as "Round Trip", and have been published in magazines since the early 1990's. Glenn Iba has collected some of them in a book; an extended introduction is available on his web site. It is an interesting read and shows how to approach the puzzles with logical reasoning without trial and error. The puzzles are similar to Slitherlink, the differences being that in Slitherlink the path doesn't have to touch every point, and the clues are numbers instead of lines. 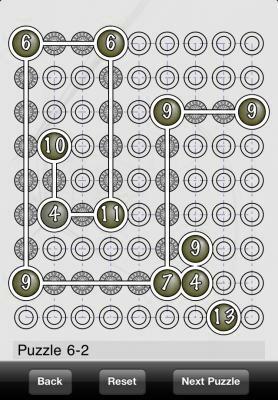 Due to the lack of numbers, I consider Round Trip a "purer", more elegant puzzle. The game contains 50 free grids. If you want to play more, there are a few packs available through in-app purchases, for a total of over 800 grids. The user interface is quick and easy to use, and it makes the game enjoyable. The only criticism I have is the same one that I made for CounterBalancE: there is no way to put a cross on the grid, as a reminder that a line cannot be in that position. This is odd since the use of crosses is explained in the book introduction I mentioned above, so the author clearly knows that they are useful. Annoyingly, the feature was actually available in an earlier version of the game, but was removed when the undo/redo functionality was added. It would be great if it could be reintroduced in a future update. Khalou is a very nice free puzzle game for iPhone and iPad by Aurelien Wenger. The instructions are only in French, so understanding the rules might be difficult, but don't despair! I'm here to help. The goal is to make all stones white. 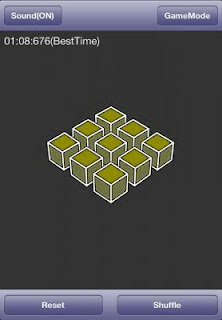 This is done by making a number of moves, where all the stones in a group are turned upside down. Turn all 3 stones in a L shape, anywhere on the board. At the top is the start position. Then the first and second columns are toggled, leading to the position in the middle. Then a L-shape in the center of the board is toggled, leading to the bottom left position. Then the final L-shape leads to the solved state in a total of 4 moves. Now if you think about the rules for a moment, you'll realise that the L-shape moves would be all that's needed to solve the puzzle, because there is a sequence of three L-shape moves that toggles a single stone, and could be applied all over the board (figuring out the sequence is left as an exrcise for the reader). The interesting thing is that, with the full set of rules, all positions can be solved in a maximum of 5 moves. It took me some time to get the hang of it, but when it finally clicked, attempting to always solve the puzzles in no more than 5 moves is an interesting—and difficult—challenge. The game also has a scoring mechanism, if you're so inclined. When you start playing, you have a time limit of 5 minutes. During that time you must solve as many puzzles as you can; for each puzzle solved, you score points depending on the number of moves and the time taken. But be careful, because if you take more than 5 moves, your score is always 0. At the end of the 5 minutes, your total score is computed and uploaded to Game Center. Overall, this is a nicely presented way to flex your brain muscles with come challenging, but not overly difficult, logical reasoning. It looks like this is a good time to talk about Lazors, a brilliant puzzle game for iPhone and iPad by Pyrosphere. The game was originally released in 2010 as a paid app, but after a major update released last week, has changed its monetization scheme and is now free. There is the possibility of buying hints through in-app purchases, but that's completely optional. The changes seem to have propelled Lazors to the top spots in the charts all over the world. At the time of writing, it's #2 in the US in the Free Apps chart, which is no small feat. When these things happen, one thinks that there is still hope for humanity. Or for puzzle game developers, at least. The goal of the game is to deflect a laser beam so that it passes across one or more specific points.This is an idea that has been used multiple times in the past, but usually in this kind of games one starts with an empty grid and needs to add and rotate mirrors or prisms. In Lazors, instead, the grid is already populated with square blocks, which need to be moved around. Blocks may be moved in any free cell of the grid (i.e. this is not a sliding blocks puzzle). As far as I know, every puzzle has a single solution. The great thing about these puzzles is that the play area is often quite small (4x4 is a common size), but the solution isn't necessarily easy to find, and might require many reflections in a small space. The game contains 120 puzzles, split into packs of 10. All packs are accessible from the start, but the puzzles in a pack must be completed in order. This is where buying hints might be useful; also note that when you complete a pack you get some extra hints for free. Each pack has a theme, e.g. "Braid" features two intersecting lasers instead of one, "Tiny" has particularly small grids, "Darkroom" uses dark blocks, and so on. In terms of logical reasoning, I found that using logic helps, but often times I reached the solution just by accident. The limited size of the boards means that there are often not that many possible positions of the blocks, so one can reach the solution even by random tinkering. This should make the game appealing to casual players that are just looking for a quick distraction and are not interested in deep thinking. Graphics are simple, clear, and very well done. I love the transparency effect on the glass blocks. There's also some appropriate sound effects which add to the atmosphere. Overall, this game is a perfect execution. Simple rules, ingeniously used to produce devious puzzles of apparent simplicity, and a no-frills interface that gets the job done flawlessly. Update 2 March 2013: version 2.1 has been released with new features. CounterBalanceE is a logic puzzle for iPhone and iPad by George Menhorn which was originally released back in 2009. A free version called CounterBalancE Lite is also available. According to the app description, the game was inspired by a puzzle created by Craig Kasper. The concept is pretty good and original. 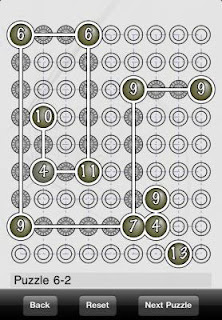 You can tap holes to turn them into extra nodes; this will create links to the closest labelled nodes in the same row or column, if they exist. Of course this is an easy puzzle; the game contains about 100, of increasing difficulty, with the largest ones using a 9x9 grid. Note that the solution above is not unique, because you could put an extra node in the bottom left corner. However, that node wouldn't contribute to the solution in any way since it wouldn't develop any new link to a numbered node. This is true for every puzzle included in the game: there is always a single solution except for the occasional possibility of adding additional, isolated, nodes. Can the puzzles be solved with logic alone, without resorting to trial and error? I suspect they could, however the game doesn't give the player the means to do so. Unfortunately to do this I had to print the puzzle and solve it with paper and pencil, because the game doesn't allow to put crosses on the board. That's a shame: simply adding the ability to put down a cross by tapping and holding on a cell would make the game a lot deeper and enjoyable. As it currently is, the more difficult puzzles feel more like randomly moving nodes around attempting to get closer to the solution. Update 14/02/2013: George Menhorn kindly answered to this review, promising to add this feature in a future update. Thanks George! Another annoyance is that the current position isn't saved when sending the app to the background, so if you don't solve a puzzle in a single session, you risk having to start from scratch the next time you run the game. A final nitpick is that the red/green color of the nodes is the only clue (short of counting the length of all the links) of whether a node is correctly connected or not. This might make it difficult for color blind people to play the game. For example here is a simulation of how a person with protanopia would see the puzzle above; it's pretty difficult to see that one of the 4's is of a different color. This is still a very good logic puzzle and for 99 cents I can wholeheartedly recommend it, but if the user interface were improved, it would become excellent.